Centre Andrew Bishop says the Ospreys have nothing to play for but pride in their final game of the Pro12. Bishop, 28, returned to action after four months out following a back operation and is set to face Connacht. He was part of the Ospreys side who saw the Pro12 play-off hopes end with the defeat to Italian side Zebre. "This is the first year I have been here [and fit] where we are playing in a nothing game and with no competition to play for," said Bishop. "It is disappointing and we have slipped up along the way and lost games we shouldn't have lost. "It is all on us and I am sure the boys are looking forward to next season and putting things right. "We want to go out and put a gutsy performance in an Ospreys jersey and show what we are about and come away with the points." 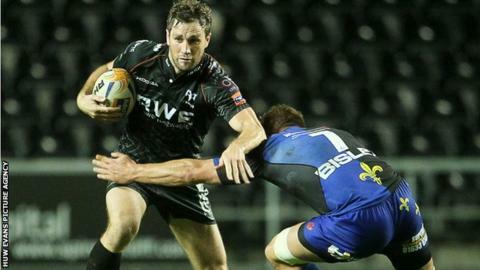 The Ospreys' final game of their Pro12 season is against Irish province Connacht at the Liberty Stadium on Saturday. The Ospreys are the most successful side in the tournament, having being crowned champions in 2005, 2007, 2010 and 2012. But the Welsh side missed out on a Pro12 play-off spot for the second successive season. Bishop, who signed a new three-year deal to stay at Ospreys in 2013, missed the final four months of last season. He returned from injury for the Ospreys' Pro12 play-off hopes and was part of the first side to lose 30-27 to Zebre in the tournament. The Ospreys joined the Cardiff Blues in being beaten by Zebre for the first time this season, while the Scarlets drew with the Italian side at the Stadio XXV Aprile. "It has been pretty hard, you have a couple of days off because heads were down after the game and there was a lot of disappointment around," said Bishop. "It was a difficult one to get over. "Going out there, you always think you are going to come away with at least with a win. "To come away after losing is a tricky one to deal with. "Saying that we have a game ahead of us, you say it is a nothing game but there will be a lot of pride at stake on the weekend. "We want to go out and put a proper Ospreys performance in."